On this episode of DTB’s “First Concert Ever”, the reggae band, Morgan Heritage, chats about the first concerts they ever went to, while on their “AVRAKEDABRA North American Tour”. 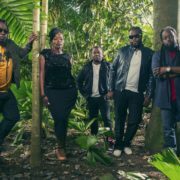 Morgan Heritage is currently support their newest album, Avrakedabra. On this episode of DTB’s “Tour Pranks”, the reggae band, Morgan Heritage, reveals the pranks they’ve pulled on tour, while on their “AVRAKEDABRA North American Tour”. Morgan Heritage is best known for their songs “Down by the River” and “She’s Still Loving Me”. On this episode of DTB’s “Bus Invaders”, we take you inside the touring vehicle of the reggae band, Morgan Heritage, while on their “AVRAKEDABRA North American Tour”. Morgan Heritage is best known for their songs “Down by the River” and “She’s Still Loving Me”. In this Crazy Tour Stories segment, the reggae band, Morgan Heritage, talk about some of their crazy moments from touring.